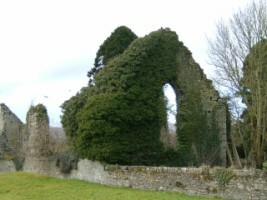 the friary church remain today and these in a very poor state of repair so that visitors are asked to keep at a safe distance. The cemetery is kept very tidy so that wild flora is difficult to find. However, it is home to plenty of trees including yew, hawthorn and evergreens providing nesting sites & cover for birds. An active interest in these little creatures is evident in the many bird feeders hanging from some of the trees. Kildare town with its historic friary, medieval St. Brigid's cathedral and round tower are situated west of the Curragh which is a proposed Natural Heritage Area (pNHA). through the things he has made.